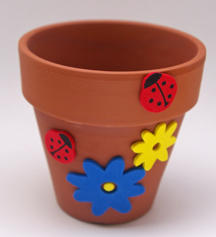 What You Need: Terra cotta flower pot; adhesive-backed foam animals, bugs, flowers, etc. How to Make It: Give each child a flower pot and offer a nice variety of foam pieces to choose from in decorating his or her special flower pot. These make a great gift.